Because Aubrey never ceases to amaze me, this post is dedicated to her :) I've been shopping in the home decor section of the fabric store lately and have found some gorgeous prints there. My theory is that people want more of a classic / modern print for their house than their garments (well, at least here) so those types of prints are more readily available. 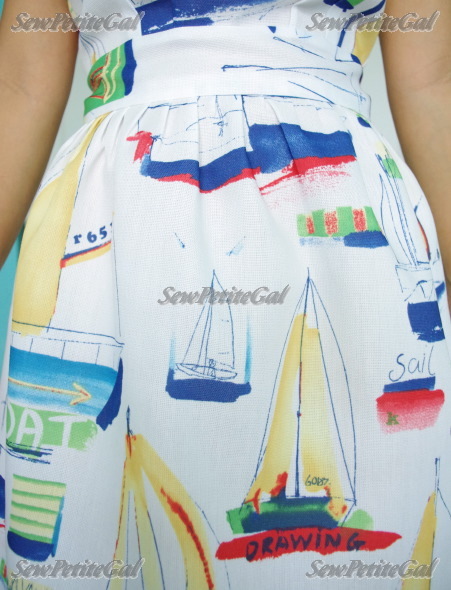 I've run across chevrons, stripes, sailboat, and map prints that can't be found in apparel. The caveat? Most have a very open weave, are coarse to the touch, and cannot be machine washed. Despite that, I found a few suitable fabrics and then some not-so-suitable ones I couldn't resist. What do you think? Is there something missing? Great job! That print is amazing. I lOve that print ! I I don't know that this dress is missing anything per se but you could spice up the look a bit with accessories. You could add a gold chain necklace or chunky gold bracelets. You could also throw in a fancy handbag (but with a summery feel) or shoes. It's best to leave the dress alone though; you can always make permanent changes when you absolutely think it'll need them. But let's not forget the most obvious part: this dress is friggin gorgeous. You always know what fits you best! Maybe a solid colof belt to break up the pattern and define the waist? Looove the print!!!! Would totally buy a shift dress in this fabric! Do you do custom orders,??? Aw, thank you, Caroline! This fabric is actually one of the garment-inappropriate home decor materials with a very open weave, stiff / coarse feel, and not machine washable. It's ok for me personally, but definitely not a saleable garment. Thanks for asking though! what about a solid color sash/belt for the waist to break up the print?? What a fun summer print! I love following all of you for your nautical updates on Twitter. The dress doesn't really seem to be missing anything, but I feel that more accessories and/or a belt at the waist would pull the whole outfit together. I think the dress looks great, and no, I don't think that there's missing anything ;-) Love the pattern! OMG I think this is one is the best things I've seen that you've made! I'm absolutely IN LOVE! I don't think there's anything missing...it's perfect! my goodness, you've made another dress!! I was just admiring your green dress in the previous post. I wish I even have half your skill. Fueled by the remarkable DIY ladies in the blogosphere, I attempted to hem my pants. Yup. It wasn't great but I saved £8 and shaved a whole week of waiting as the tailors here are inundated with alteration requests. Interesting that you find better patterns in the home section! The shape and fit are pretty cute. Don't know what's missing though I love Aubrey's suggestion of gold buttons on shoulders. Can we get a close up of the necklace too? Love this!! It is gorgeous!! May be a flower pin? SPG, that dress is gorgeous!!! Love that and I def admire your talent. I think someone mentioned it before but I've got to repeat it - if I had your sewing talent, I would never shop, I've just create stuff that fits me perfectly. That dress, that print! the print is so cute. oh my gosh you are so talented. Did you make a mini one for your baby as well? You pick awesome fabrics. That's super cute. I agree it could use a solid belt. You have a few color choices. The Tal sandals look cute on you. shoes are perfect for this dress! I didn't know that shopping in the home section is what you've been doing & this is where you've found your latest fabrics. Neat! Now usually for dresses like this, if you did it by pattern, do you use an invisible zipper & place it on the back side? I have no suggestions...just wanted to say you are so amazing! My mom used to sew and knit our clothing, I regret being only a dilettante. You are certainly inspiring! Oh my goodness, you are so kind - thank you! Aubrey is pretty awesome. I'm honor that you asked me for suggestion. The dress is prefect. You always find the cutest prints. Aw, thank you, Ying! I love my fellow Anchor Brigade comrades! Wow, that's amazing that you made that dress! I love the print and think it looks great as is! If you want to add something, how about a blue peter pan collar? It'll add to the prep factor of the dress and make it pop. Maybe some piping on the sash and arm holes, like in a blue to match the bottom of the boat? I love the pattern on the fabric you used for this, but I must say that I especially love the style of this dress! Was this self-drafted or did you mix and match: the bodice from one pattern, the skirt from another, etc? Thank you! I used the bodice from McCall M5972 (modified this way: http://sewpetitegal.blogspot.com/2012/12/tutorial-altering-commercial-pattern.html) with a self-drafted skirt.